Join the Vistara channel to learn how to manage, maintain and optimize your modern IT environment in a service-centric, way. Learn from industry practitioners and Vistara customers on how to effectively and efficiently deliver services across the enterprise. Operations teams face IT environments that are increasingly large, more dynamic, and distributed across private and public cloud infrastructure. To manage such environments effectively, IT operations team must reimagine traditional management models and design new approaches. 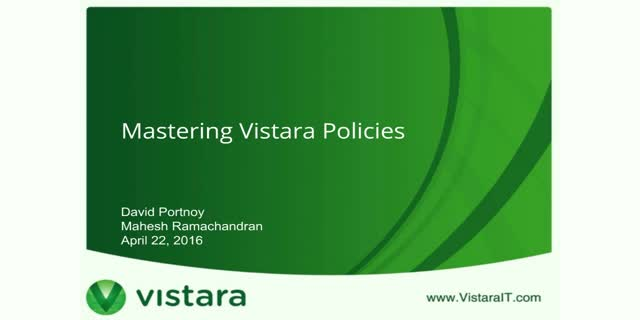 In this webinar, Vistara sales engineer, David Portnoy, will discuss how administrators can use Vistara’s powerful policy framework to preprogram actions and automate routine tasks. Vistara enables IT and business teams to define multiple dashboards and customize each dashboard for delivering better insights to users. Vistara dashboards deliver a heads-up display of an user's most important metrics as soon as they log into Vistara and help users create alerts based on what matters most to them. Vistara Solution Architect, Radhakrishna Kukunuri will demonstrate best practices for creating dashboards in Vistara. You will understand how to build custom dashboards and use them across your enterprise. Vistara service maps allow your IT operations teams to manage a service comprised of disparate resources as a logical entity. By visualizing service topology and understanding the relationships between resources and services, IT teams can proactively prevent business-impacting events and react to issues with better situational awareness. Vistara Solution Architect, RK Kukunuri will demonstrate best practices to create service maps in Vistara, including the right planning methodology, setting up policies and for an application like Exchange, as well as a more complex composite cloud service. DevOps breaks down the barriers between Dev, Ops and business teams to deliver measurable business results. Vistara lets you keep pace in this continuously changing environment with hybrid cloud management and policy driven discovery and device management. The cloud is fundamentally remaking enterprise architectures. Partners need to be seen as trusted advisors to enterprises embarking on cloud transformation initiatives. Whether it’s public or private cloud, compute or any other resource, Vistara allows you to manage any cloud element in a single dashboard. Vistara is ideally suited for enterprise customers that need to holistically manage legacy on-premise infrastructure and dynamic public cloud environments. As application release velocity becomes a reality for the enterprise, DevOps professionals must consider how and when to transition brownfield enterprise applications to an agile approach. With production applications on legacy infrastructure, how do you think about “changing the engine on a flying plane”? Rob Berger is currently Architect at Mist Systems and a noted visionary in the DevOps space, with hands-on experience in automating large enterprise class workloads and migrating traditional product development to agile methodologies. A powerhouse in the game development community, Epic Games develops cutting-edge games and cross-platform game engine technology. How does Epic manage a highly dynamic infrastructure that supports operations of live content and products? John Tonthat is Director of Marketing and Business Development at Avnet Technology Solutions. In his role, John helps channel partners create cloud-ready solutions for growing their customer base in a crowded market.